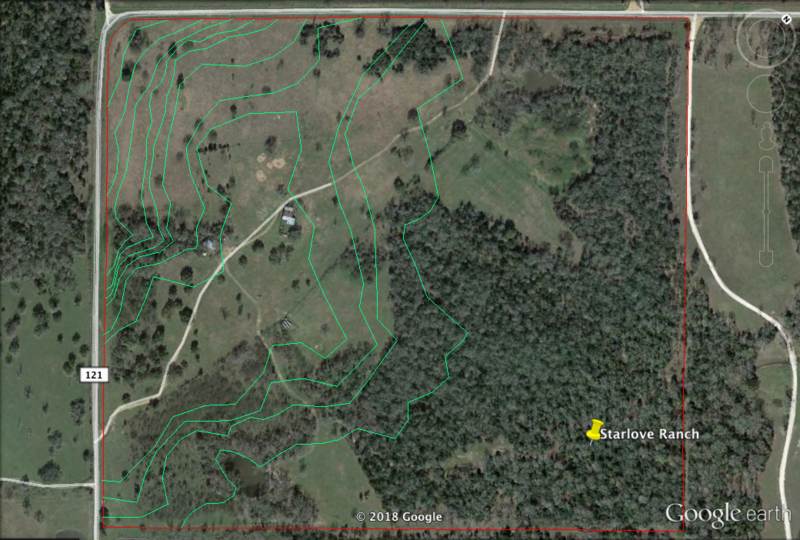 Starlove Ranch is a 100 acre property near Giddings, Texas that is currently being continuously grazed by cattle for a small beef production operation. The ranch is transitioning from animal production to plant based production. They are working in partnership with the organization Farm Transformers that promotes and supports vegan farm transitions and farm animal sanctuaries. The 26 cattle will stay on the land safe from the sale barn and be managed to help kickstart the plant based production. Starlove Ranch is also aspiring to build a beautiful camp out wedding venue on the land. I will now take you through each layer of the design (excluding climate) which was created using the Regrarians Platform and Google Earth Pro. The image below shows the property boundary and a roughly accurate topography map for most of the property at 2 ft intervals. It was difficult to get good information of the topography in the forested areas. However, I was able to get enough information to make design decisions and verify them in the field. The land is beautiful with low rolling hills and thick forested areas. The soil on the surface is a sandy clay loam but the clay layer beneath is heavy and impermeable. There are post oaks, live oaks, yaupon holly, eastern red cedar, mesquite, huisache and cedar elms growing on the property. Starlove will begin managing the cattle a bit differently, switching from continuous grazing to managed rotational grazing. To protect the land from overgrazing and ponds from erosion the animals will be moved around the property using electric fencing. This can be done effectively but more water availability will be needed around the property. 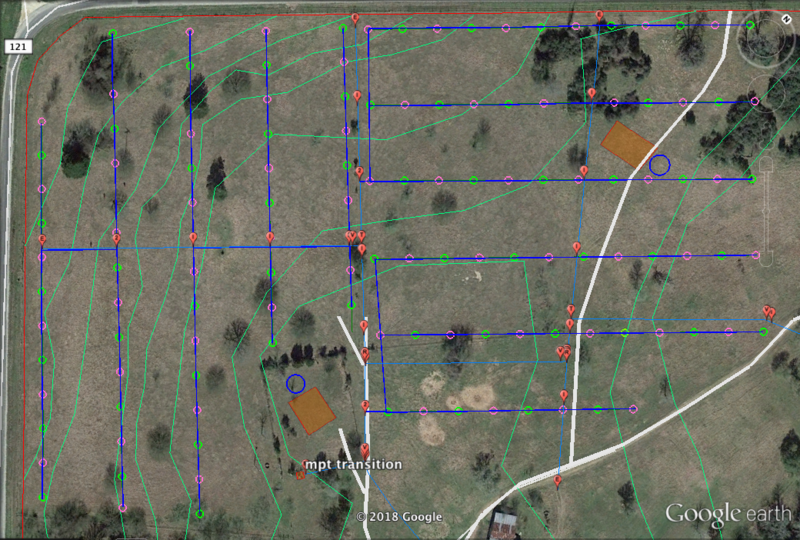 The light blue lines in the image below are underground water pipes that carry water around the property so that cattle can be paddocked away from the ponds and still have water availability. Having clean water on demand with a float valve will also keep the cattle healthier than allowing them to drink and defecate in the same water at a pond. We will also use this system to irrigate trees,shrubs and the garden. Water pipes will also provide water redundancy to the house sites which should also have rain tanks. We will be fusion welding polyethylene pipes from 3/4″ -2″ in diameter, no pvc. All fittings will be underground in irrigation boxes safe from frost. 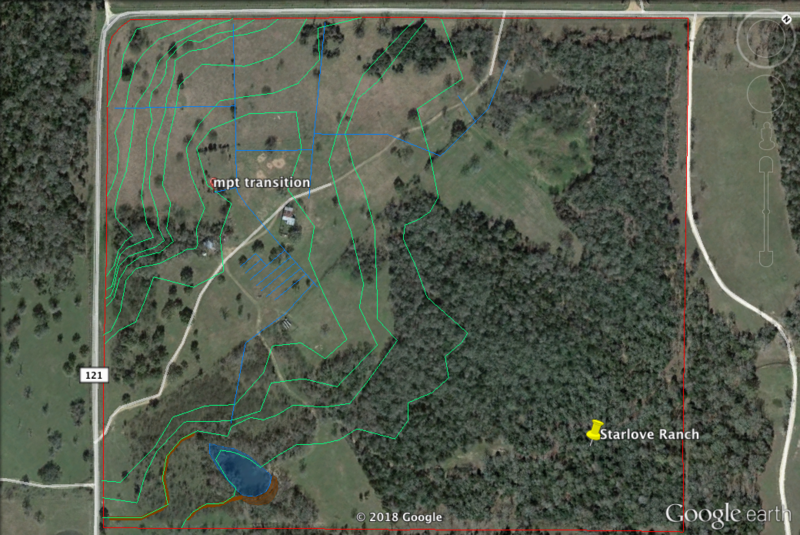 The pond is also marked in blue with the dam wall in brown. There are also brown lines that mark berms and swales to be built to increase the ponds catchment area by 50 %. This next photo shows all the fittings like valves, tees, inline assemblies, reducers, transitions, and 1/2 poly pipes for surface irrigating trees and shrubs. Each pin has a parts list and description designated with it. This next image shows the access system around the property. I added a road loop and also another road into the huisache thicket. The roads going into the pastures do not have to have road base, they are just more like farm tracks. The entry road will be build up to two lanes to accommodate wedding venue traffic. The brown lines show foot paths around the reception area and camping sites. The grey rectangles are parking areas. The parking is right off the road and requires much less grading work, equipment rental and materials moving than building a single parking lot. Big money saver here. This parking design yields 70 parking spots. There are also two culverts that need to be installed to maintain positive drainage around the driveway. I try to keep the roads on ridges or near contour for ease of maintenance and longevity. The dark green shaded areas show where various kinds of trees will be planted. Because it is a wedding venue I would like to plant some native trees that are beautiful and nostalgic like pine, oak, sycamore, cottonwood and cypress. These are along the pond, the entry way of the property, around the reception area, etc… The green and pink circles mark tree cages that will protect the nut orchard from cattle, deer and hogs. Every other tree in this orchard is a pecan the rest are a variety fruit trees, forage trees, pollinator trees. Each tree cage will also protect 3 blackberries. This is like a zone 4 area of mixed forestry. 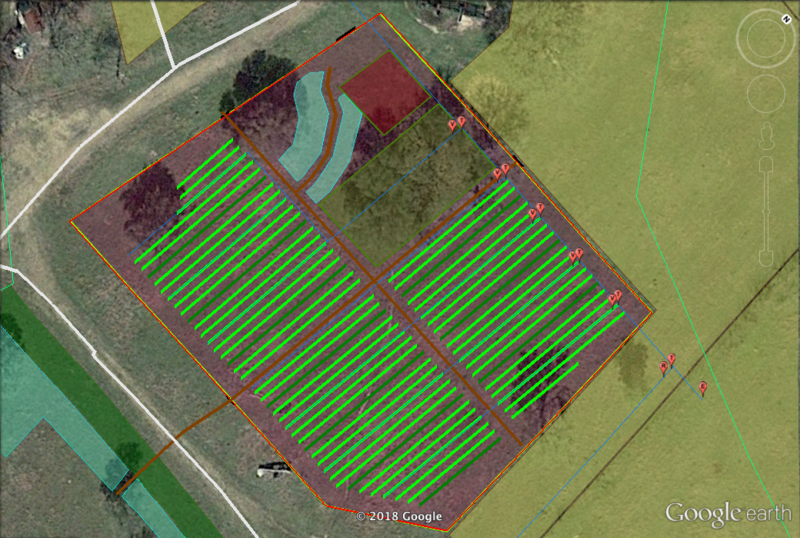 This layout is around 130 trees and nearly 400 blackberries in the back fields. They have 110 ft alleys between the lines and the trees are at 50 ft spacing in the lines. The tree cages will be 8ft squares made from cattle panel and T posts. Each cage will have irrigation set up on a battery operated timer. The rest of the trees will need much less protection since the cattle will be excluded from those areas. The following image is a close up of the orchard. The orchard is laid out in straight lines for ease of cattle management with electric fencing. However, the straight lines also adhere closely to key line patterning for soil and water conservation. This pattern mostly moves water towards the ridge in the pasture. The ground will be prepped with a keyline plow before the trees are planted, each line of trees will get 6 rips. We will not be key line plowing the grazing alleys. The blackberries will provide a bounty of reliable fruit for the family and their farming operation while the pecans will provide long term profits and benefits of a beautiful food forest. There are various building plans for this property including a cabin, two homes, and a shipping container storage facility. The buildings are marked with orange shaded rectangles, the homes are all accompanied with rain tanks indicated with blue circles. The family is also very motivated to have their homes built to harvest solar energy on the roofs. This will be a great option as grid electrical would require criss crossing the of electrical lines and poles across the property. This property already has perimeter fencing and many functioning interior fences that we will be working off of. The cattle fencing will be adjustable and movable so it is not indicated in this next image. The only new fencing needed is a 6ft fence around the new garden site. The fencing will be built with 10ft 6×6 posts that are 42 inches in the ground, 2×4 wire fencing and a total of 5 gates. The yellow areas are grazing areas. I suggest moving the cows with electric fencing. The brown lines around the yellow are suggested paddocks cows can be moved to. Managing like this allows other pastures to recover from grazing and grow better forage. They will still have to feed the cows, monitor their body condition and monitor their manure. The cattle are unadapted herefords that need selective grazing to maintain body condition, but the land needs to be rested from grazing as much as possible, so paddocks sizes will be moderate and moves will be carefully managed while also provided supplemental feed. The turquoise shaded areas are wildflower prairies and will have to be managed by occasional mowing or grazing. These painted prairies will be beautiful in the spring and show off the natural Texas beauty of this land. The pink area next to the barn I am proposing to become a 1 acre garden where the family can grow plenty of veggies, herbs, and fruits. They will be able to plant 50 fruit trees here in this garden and many productive perennial shrubs. This garden will be right next to the reception area where interested guests can walk through and experience the beautiful poly-culture garden! The following image shows a close up of the garden. The light green lines show the way planting will be patterned. These areas are 30 ft wide and will be managed as a no till system and rotated from high productive crops to lower value cover crops each year. The dark green lines are rows of fruit trees and productive shrubs. The gardens will have rotor sprinkler heads down the center of each annual alley. There is a 10 ft headlands between all planted areas and the fence. We will prep the ground by deep ripping with the key line plow, the use a tiller to disturb the grass and weeds that are currently growing. We’ll top off this off with a layer of minerals, seed, compost and mulch. The ground will not be tilled again and we plan to have plants growing year round as much as possible. The green shaded rectangle represents the nursery and mushroom growing area in the shade of the live oak trees. The red shaded square is a materials staging site within the garden. There is also pollinator garden areas indicated in light blue. Aside from growing fruit and vegetables Starlove Ranch will also be host guests as a camp out wedding venue. The Ceremony area is shown as the purple rectangle near by the pond. This area will be private, cozy, and overlooking the remodeled pond. The ceremony pad will be 75’x50′. The reception area is the purple rectangle near the garden, 110’x70′. Guests will gather here after the ceremonies. 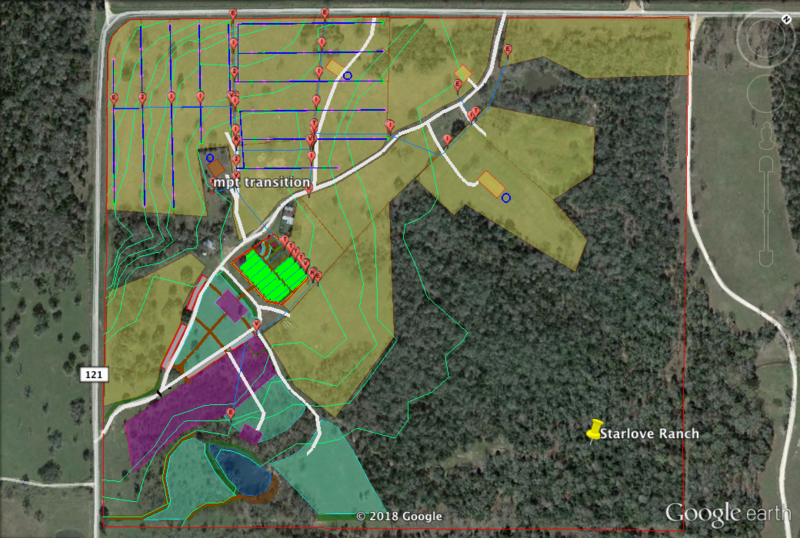 The remaining purple areas show where camp sites will be developed. Starlove Ranch will be installing a grid tie solar system on their new well house to power the farms reticulation system with the sun. The future homes are also being planned to include solar with battery powered systems. Hopefully in the near future this system will be much more optimized and affordable. The orange line indicates where existing grid power lines are in place up to the meter. By using solar we will limit the amount of power poles and power lines crossing long distances over the property. I am looking forward to getting started on this unique and challenging project.